Evolution LTE is Vision Metering’s new fully-loaded meter with under-the-glass 4G LTE modem (Verizon Wireless) and remote disconnect switch. The Evolution modem utilizes a Ublox modem chip controlled by a Linux Operating System. The standard 4G modem board has optional RS 485, Ethernet and ZigBee. The modem operates in Band 4 and 13. The modem is mounted to the Vision XT meter PCB and can be installed in all meter forms. An optional 200 amp switch is available in Form 2S and 12S meters. The meter/modem combination is also available as a UL listed device. Vision meters come with 12 channels of Load Profile, TOU, Reactive, Net Metering, Demand, Voltage and Current. There is no extra charge for the above functionalities. Communications with the meter through the Evolution modem can be accomplished using the Vision 2020 software or, alternatively, a developers kit can be provided to allow existing head end software to communicate with the meter. There is also a TIM for Itron’s MV-90 and Primestone’s PrimeRead system. The Evolution modem utilizes a Ublox modem chip controlled by a Linux Operating System. The standard 4G modem board has optional RS 485, Ethernet and ZigBee. The modem operates in Band 4 and 13. The modem is mounted to the Vision XT meter PCB and can be installed in all meter forms. An optional 200 amp switch is available in Form 2S and 12S meters. The meter/modem combination is also available as a UL listed device. Vision meters come with 12 channels of Load Profile, TOU, Reactive, Net Metering, Demand, Voltage and Current. There is no extra charge for the above functionalities. 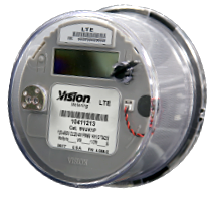 Communications with the meter through the Evolution modem can be accomplished using the Vision 2020 software or, alternatively, a developers kit can be provided to allow existing head end software to communicate with the meter. There is also a TIM for Itron’s MV-90 and Primestone’s PrimeRead system.